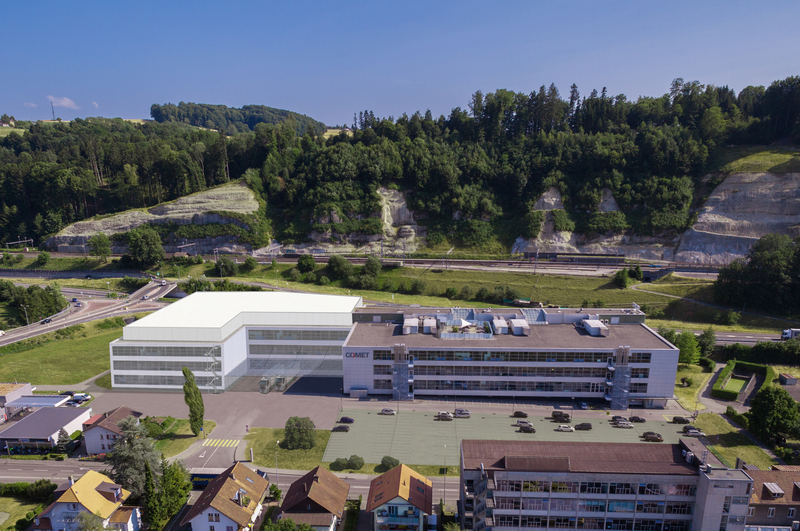 The COMET Group has submitted the building application for an extension at its headquarters in Flamatt, canton of Fribourg. With this construction work, the company will extend its heavily utilized production capacities and create the basis for further planned growth. With its investment of around CHF 60 million, COMET is choosing to focus on its Swiss site. The COMET Group is developing its innovative core components based on X-ray, high-frequency and e-beam technology at its headquarters in Flamatt. As a result of its strong growth in recent years, the company in Flamatt has reached the limits of its production capacity. In order to create new space, particularly for the X-ray and e-beam business, and to facilitate the strong growth envisaged for the future, the COMET Group decided to build an extension at its Flamatt site. This will almost double its currently available space, from 20,000 to 37,300 square meters, and – as a longer-term consideration – create the workplace for more than 250 additional employees. The building application was submitted on 30 July 2015. The construction work is scheduled to start in April 2016, and the new buildings with the additional production cells are expected to be ready for use by the end of 2017. The cost of the building work is estimated at CHF 60 million. Since moving into its headquarters in Flamatt 12 years ago, the COMET Group has grown from a Bernese company with 230 employees into an international technology group that now has 14 sites and over 1,050 employees worldwide. In that time, its revenue has almost quadrupled from CHF 74.3 million in 2002 to CHF 287.9 million in 2014. The extension of the production site at its Flamatt headquarters will form the basis for this internationally active company to strengthen its market position even further.